The 2012 Giro was won on the Col du Tourmalet. Wind back two years, to the final mountain stage of the 2010 Tour de France. In the thick mist at the summit of the Col du Tourmalet, Andy Schleck and Alberto Contador, the two strongest climbers in the race, are fighting out the stage. Behind them, just over a minute down the mountain, the best of the rest, a fragmenting group of six riders, are wringing the last drops of energy from their bodies on one of the hardest climbs in cycling, with almost three weeks’ racing in their legs. There are no tactics left: the riders will come in today in order of how strong they are. And look at the rider in fourth place on the line: Ryder Hesjedal, the revelation of the 2010 Tour. In this final contest of brute endurance, the Canadian has been distanced only by Contador (who will later go on to be disqualified for a positive doping test) and Schleck, by a minute. Just one more rider lies a handful of seconds ahead of him. 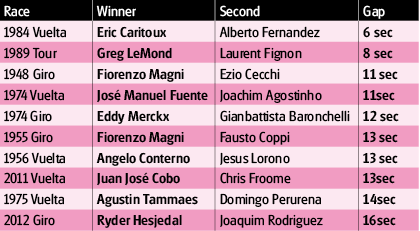 Significantly, for the 2012 Giro, that other rider was Joaquim Rodriguez. Anybody who was paying attention would realise that Hesjedal is a rider who finishes Grand Tours strongly. Hesjedal’s Garmin team manager Jonathan Vaughters was paying attention, and last year, he had an idea. At Garmin’s pre-season get-together at the team’s base in Boulder in November, Hesjedal was summoned to a meeting with Vaughters, and managers Allan Peiper and Charly Wegelius. 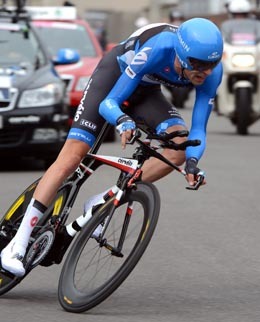 Hesjedal, Vaughters suggested, should lead the team at the Giro. It would involve a complete restructuring of goals and training. “He wasn’t very keen on it at first,” Vaughters tells Cycle Sport. “He felt it wasn’t so good for getting ready for the Tour and he didn’t know if he liked the idea. He felt that the Giro was hard, and didn’t believe he could do well there,” he continues. Wegelius helped with the persuasion. Hesjedal bought in. He’d lead the team at the Giro. 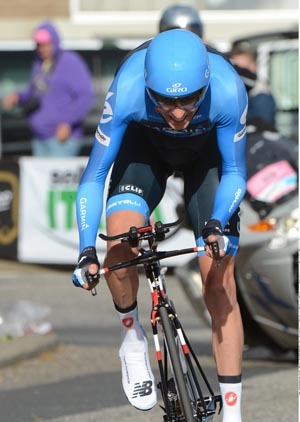 The stage one time trial of the 2012 Giro in Herning, Denmark, was one for the purists. Taylor Phinney and Geraint Thomas dominated it, with Garmin’s Rasmussen in third. The top 10 was a rogue’s gallery of meatheads and flat-track bullies. 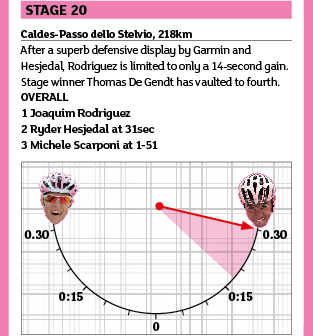 But was it here that Hesjedal struck his most important blow? He was the best of all the GC contenders, finishing 17th, 29 seconds behind Phinney, but 14 seconds clear of 44th-placed Joaquim Rodriguez. 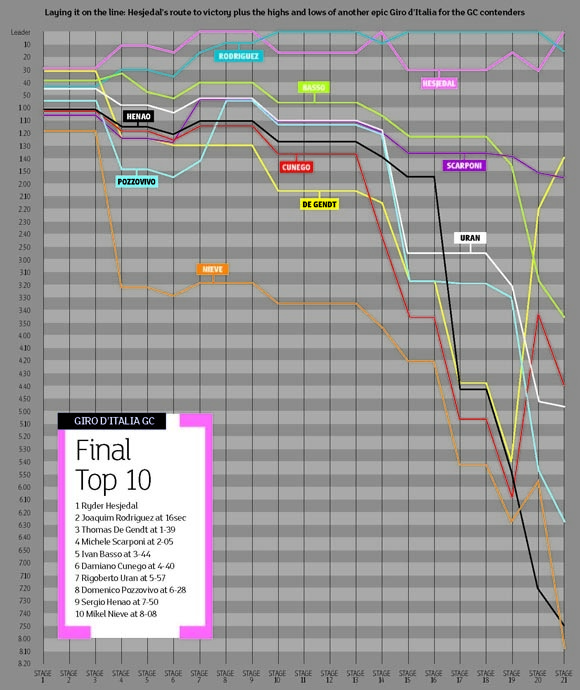 It was a curious event in terms of the final result: of the final top 10, only Hesjedal finished within 30 seconds of Phinney, but it was their times in relation to each other which were important. “I took a huge boost in morale from that stage,” Hesjedal tells Cycle Sport. Garmin also had their secret weapon in Herning: Robby Ketchell, the team’s biomechanist, physiologist, aerodynamicist and nutritionist. “There was a lot of focus on this prologue,” says Ketchell. “I’ve never seen Ryder start a time trial like he did this one. Down the ramp, he started fast and was cornering very well. This was the first race he did on the [Cervélo] T5, and he was doing corners in the aero bars that he wouldn’t have done before. He was at one with his bike. The other notable thing about the Herning time trial was the performance of Garmin as a whole. Rasmussen was third. Five Garmin riders were in the top 17, and all but one finished in the top 50 — Peter Stetina was 52nd. 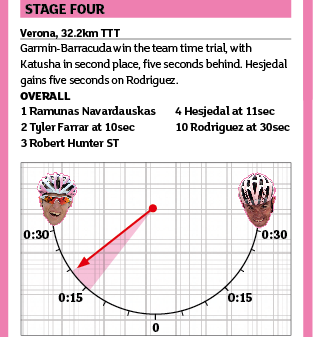 The 2012 Garmin Giro squad wasn’t the A-team and, at first sight, it looked light on climbers. But every rider was there for a reason. Hesjedal was there for the general classification, with Christian Vande Velde as his main climbing support. Vande Velde’s part in the plan was significant — historically he has benefitted from riding two Grand Tours in a season — so he’d support Hesjedal as well as build towards the Tour de France. The other climbing domestique was Peter Stetina, who’d quietly come 21st in his Giro debut the year before. Tyler Farrar was there for the sprints, although he’d crash out of the race early, while the road captain was Robert Hunter, a master of the dark arts of understanding the dynamics of the peloton. “He knows the races inside out, and he organises everyone on the road. He’s the link between the riders and the team car,” Wegelius says of Hunter. “There are things riders like him can feel in the group that you can’t see from the car; he’ll see a team starting to chase, or he’ll have talked to somebody who knows something. He doesn’t mince his words and he’s very clear, which is what you need in a race,” he says. The rest of the team were what Allan Peiper describes as “musclemen” – Sebastien Rosseler, Ramunas Navardauskas, Jack Bauer and Alex Rasmussen. “Part of the equation was going with Tyler for stage wins, and strong guys for the TTT,” says Peiper. 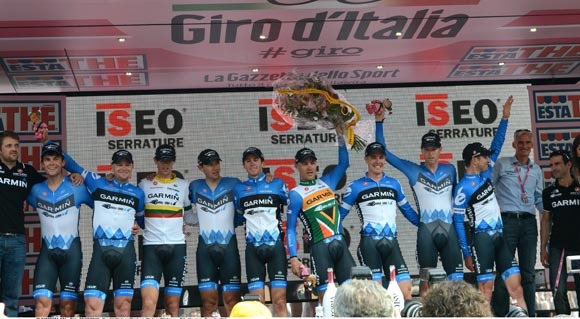 Garmin looked like a strong team for the TTT, but surely not a Grand Tour-winning team? Vaughters disagrees. “We chose a well balanced team. Lots of big strong guys keeping Ryder out of trouble on the flat, with enough climbing talent to support him in the mountains,” he says. While the peloton contested the two road stages in Denmark, Ketchell flew ahead to Verona to make final preparations for the team time trial. “I was able to drive the course, look at it and nail the final details. I had videos, profiles, terrain and weather reports, and I took it back to show the riders at the meeting. On the rest day we were able to recon it with the entire team, doing rotations, seeing the start and the finish. We could see that the middle was very important, with some big hills,” he says. Garmin’s attention to detail in team time trials borders on obsession. Every detail is planned and the order of rotation is tweaked, worked on, and perfected. The team practiced standing starts until they could achieve top speed, with everybody in the right place in the line, as quickly as possible. This approach had resulted in a win at the Tour de France last year, and they did the same at the Giro. But it didn’t all go to plan. Alex Rasmussen, their best rider overall, got tailed off in the tough middle section in the Verona test, and the team had to quickly adjust. “With TTTs, a lot of people say you can dial in all the details,” says Ketchell. “But it’s also the event with the most variables. When things go wrong, you have to be flexible. Alex still did a great ride and performed for the team, but the hilly section was tough and he had no choice but to sacrifice himself, which was a noble effort,” he continues. Momentum is everything in a Grand Tour. It’s hard-won and easily lost, and it had been uppermost in Wegelius’s mind since that November meeting. “The biggest concern I had was Denmark,” he says. “We saw with the start in Holland a couple of years ago what can happen: crosswinds, crashes. When I saw Ryder’s stage one result and how well he came out of Denmark, I knew top five was possible. Some people said his win was because of the team time trial, but what we really did in Denmark and Verona was set a positive tone. 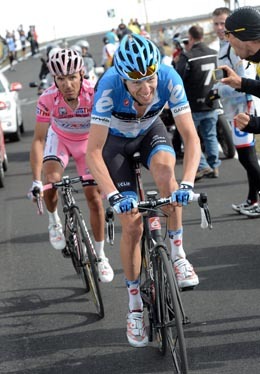 Garmin showed how confident they had become when Hesjedal took the pink jersey a few days later on stage seven. He’d already missed out on taking the lead when the early break stayed away on stage six, and Adriano Malori stole in front of him, to Hesjedal’s frustration. 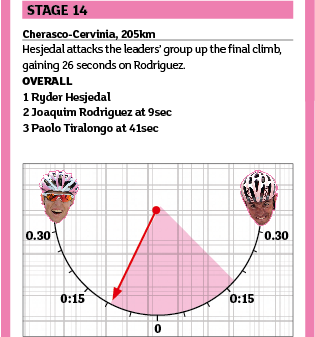 Stage seven was the first hard uphill finish of the Giro, and Garmin showed how much thought Vaughters and the team managers had put into selecting the team, and how to play to their strengths, in spite of their perceived weakness. Garmin didn’t have a full team of climbing domestiques, so they exploited their strength on the flat instead. “We had a team that was able to go at 55 kilometres per hour to the base of the climbs, and that put us one step ahead of the other leaders. They were stuck 50 riders back and having to close gaps on the climbs,” Vaughters explains. It wasn’t just a case of being able to hammer to the climbs, either. The pacing has to be more finely-judged than, say, a sprint lead-out, and one rider in particular was very good at it. “Alex Rasmussen is a brilliant time triallist. But he rides on the track, too. He can ride in the wind all day, but he has that smoothness of acceleration from the track, so he can ride on the front without putting a climber into difficulty,” explains Wegelius. “When you work with riders used to leading out sprints and ask them to place a climber in a good position, it’s not the same thing. You don’t deliver the guy to the bottom at full sprint, for him to do 15 seconds all out — he’s got to keep going for an hour. Garmin went to the front of stage seven with 40 kilometres to go, and led the bunch to the base of the climb to the finish at Rocca di Cambio. “We had it lined out, slightly downhill, dust coming off the road at 65 kilometres per hour, and our guys were drilling it,” says Peiper. “We’d done some recon of the final, and Vande Velde knew to lead into the downhill before the kick-up with 1,300 metres to go. Ryder turned into the corner first and got a gap. He got caught, but got his breath to hang on and stay with them to the line and take the jersey. We talk about him winning the Giro by 16 seconds but we could have lost 16 seconds on that single day, just by not having the team do what we did, or not doing the recon. Hesjedal and Rodriguez spent the next week and a half swapping the pink jersey back and forth, never separated by more than a handful of seconds. The parcours favoured one, then the other. 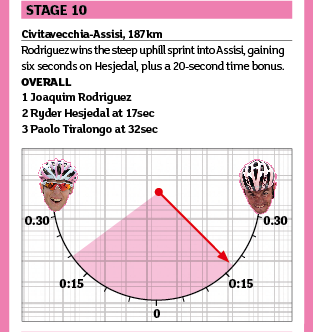 Stage 10, with a violently steep uphill finish in Assisi, was perfectly suited to Rodriguez, and the Spaniard took the pink jersey, in spite of another well-executed lead into the climb by Garmin, which kept Hesjedal close behind. Four stages later, Hesjedal took the lead back with an aggressive, well-timed, clever and strong move on the climb to Cervinia. Before this stage, Hesjedal had looked like a good rider who’d taken advantage of favourable terrain to keep his place in the top three. After this stage, he looked like a potential winner, and his rivals should have known it. “It was hugely important. If I hadn’t gained those 26 seconds, who knows what would have happened?” Hesjedal asks. At the time, it looked like his rivals might not have been too worried about him going away from them. Hesjedal was growing in confidence and stature as he pulled on the pink jersey that evening, and Wegelius was starting to think that aiming for the top five was setting their sights a little low, but that they still had to be careful. “I got to the team bus and had to ride a bike up the final kilometre to take Ryder’s recuperation drink to him. I remember riding up thinking, ‘this is brilliant, but now we have to calm him down and make sure we think rationally, and cold-blooded,’” says Wegelius. “I was working out in my head how to keep him calm without putting a downer on the whole thing, how to tell him that it wasn’t necessary to defend the jersey, but in a way that wouldn’t demoralise him. And then Rodriguez took the jersey back the very next day on the steep final climb to Lecco. Hesjedal finished the day 30 seconds down overall. 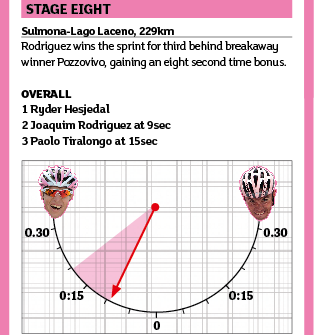 With three very hard mountain stages to come, Rodriguez was the favourite again. 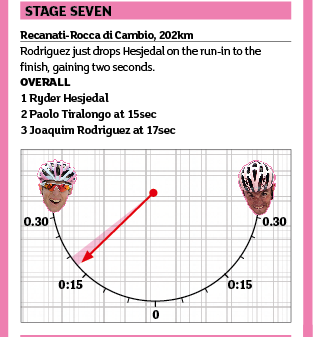 It was actually Ivan Basso who was riding the most like a favourite, well into the final week of the Giro. Day after day, he set his Liquigas climbing domestiques, probably the best in the race, to work. 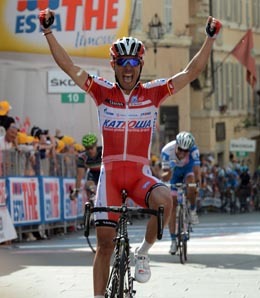 They burned off everybody except Basso and his strongest rivals, but the 2010 winner was unable to take advantage of their work. In fact, through the race, Garmin had been careful to conserve their resources. The Liquigas mountain tactics suited Hesjedal perfectly, and took the pressure off Garmin having to dictate the pace in the mountains when they were short-staffed. On the surface, the tactics looked nonsensical, especially seen in the harsh light of hindsight. But in Vaughters’ opinion, they had no choice. “The only way for Basso to win is to keep a high sustained pace for long periods of time, and then he can grind everyone’s legs off, like he did in 2010,” he says. On the stage to Cortina d’Ampezzo, Liquigas had stifled the race, while Hesjedal and Rodriguez matched each other on the climb. It looked like stalemate, but with the fearsome climbs of Alpe di Pampeago and the Stelvio to come, it was hard to see Hesjedal matching Rodriguez. Except for one thing: Garmin’s final trump card. “I’ve got more info than you guys on Ryder’s physiology,” Jonathan Vaughters tells Cycle Sport. “And the thing that’s interesting about him is that as he gets fatigued, his power levels don’t drop off. So if you can find a race that’s going to be decided in the third week, he’ll be good at it. “When we saw the Giro, we said, ‘wow, the Stelvio with two days to go, and a time trial… it’s loaded in the back end’. In a weeklong race, Ryder can get top 10, but he’s not great at those because he’s a diesel. Basically, he won the Giro because he out-dieseled everybody. He wasn’t spectacular anywhere, but he never faltered, while everybody else was getting fatigued. “He also has an incredible capacity to absorb hard work. Some riders have a high VO2 Max, me for example. But I never had the ability to absorb work – I always got sick or injured. Some riders can be under-23 world champ, and have real talent given a certain training load. But when they go from 22,000 kilometres a year as an under-23, to 32,000 kilometres a year as a pro, they break down. Alpe di Pampeago, the finish of stage 19, left Allan Peiper with two striking memories of Hesjedal’s Giro, one before the stage, one towards the end. “The night before Pampeago, in the team hotel, I was watching Ryder. The staff were eating on one table, the riders on another, and he was turned 90 degrees from me. 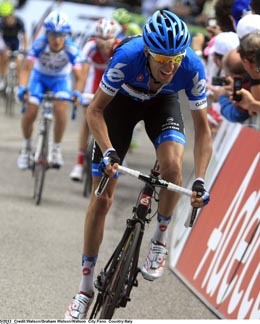 Hesjedal turned the race on its head on Alpe di Pampeago. Pundits speculated about how much time he would cede to Rodriguez on its steep slopes, which on the surface, suited the Spaniard more than the Canadian. 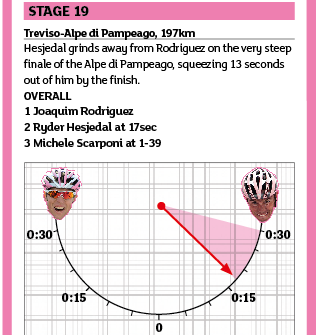 Rodriguez himself probably anticipated this being a climb on which he could win the Giro. But none of them took into account the fact that the race was almost three weeks old. 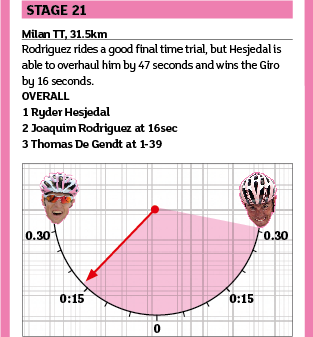 Any advantage Rodriguez had would be negated by Hesjedal’s extraordinary stamina. “I knew they had to do something to me on the climb, and all I had to do was watch out for the attacks and respond,” says Hesjedal. Hesjedal’s attack on Alpe di Pampeago put him 13 seconds closer to Rodriguez, just 17 seconds behind the Spaniard overall. It was at the moment of Hesjedal’s attack that Peiper became convinced he would win the Giro. 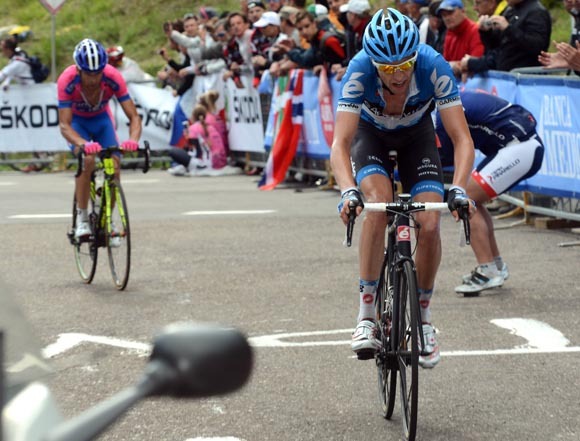 Stage 20 of the 2012 Giro, to the summit of the Stelvio, was one of the finest day’s racing in the last decade, a reprise of Cadel Evans and Andy Schleck’s duel on the Col du Galibier in last year’s Tour, but with more tactical finesse. It was a stage in which only the strongest riders could hope to survive yet it was raced in a very tactical way. The stage crossed some early climbs, then the very steep Mortirolo, before a long valley drag up to the base of the Stelvio. There were several tactics being employed, some of which looked well-planned, others of which looked hastily improvised. “I know what it feels like as a rider to sit on the bus on the morning of stage 20,” says Wegelius. “I told the guys all they needed to do was be a little more special for a few hours. I knew his rivals would throw everything at us. I could see the reactions to Hesjedal’s ride on Pampeago. Christian Vande Velde joined the early attack, yet Peiper and Wegelius made Garmin ride on the front of the bunch. They didn’t want Vande Velde too far ahead, so that they could call him back if they needed him. Thomas De Gendt of Vacansoleil attacked over the Mortirolo and joined up with his team-mate Marco Carrara who’d also escaped earlier in the day. As the Belgian stretched away, Hesjedal suddenly looked isolated; with Vande Velde ahead, and Stetina getting dropped on the Mortirolo, his rivals hung him out to dry. Rodriguez didn’t chase, nor did Scarponi, who at least had the excuse of his team-mate Cunego also being in the escape. De Gendt’s lead stretched to over five minutes at one point; he was threatening to win overall, and still Rodriguez and Katusha wouldn’t chase. Once Vande Velde and Stetina were both with Hesjedal, which took longer than hoped when the younger rider punctured and had to chase on for the second time, Garmin went to work. Stetina got them into the Stelvio climb, then Vande Velde took over. Vande Velde, in Wegelius’s opinion, was key to Hesjedal’s win, both for the work he did on the road, but also the work he did before and after the stages. As Garmin set about rescuing the race on the Stelvio, the riders knew that the next 45 minutes would decide the destiny of the pink jersey. Peiper was anxiously watching from the team car. Wegelius wanted Hesjedal to leave it as late as possible before committing himself fully. “We waited as long as we dared, and said, you’ve got to ride now. Ride in the gutter to make them suffer in the wind, and ride a time trial to the finish. Don’t turn around. 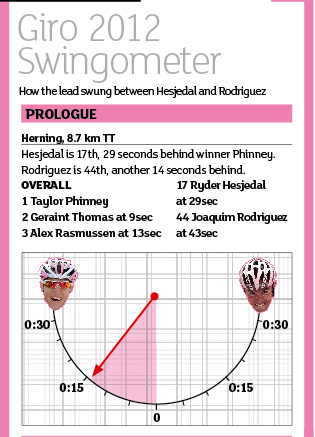 Rodriguez isn’t attacking you now, because he can’t,” says Wegelius. 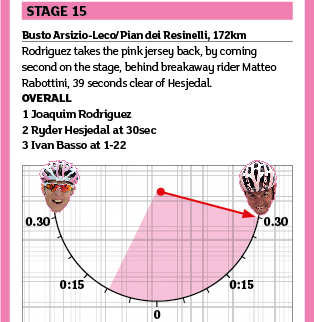 The closer Hesjedal got to the finish without Rodriguez attacking, the better it was. With 800 metres to go, the Katusha rider went for it. “Rodriguez, to his credit, threw everything he had at Ryder at the end,” says Peiper. The brave Spaniard gained 14 seconds, but he must have known it wouldn’t be enough. Robby Ketchell had gone to the USA after the team time trial, to work with Garmin at the Tour of California. But he had one last job to do in Italy, and he flew to Milan to help Hesjedal’s final effort of the race: the stage 21 time trial. “I got to Milan and started reconning the time trial course,” says Ketchell. “It was like a giant prologue – unlike most time trials, it was in a city, so there were a lot of corners. People were saying Ryder could gain three minutes, but I could see that wouldn’t happen. In a straight out-and-back course it would be just him against his competitors, but there were more variables here. The team used the splits from the riders who set off early in the day to guide them for Hesjedal’s effort. The most technical section was at the start, and that’s where the time was being gained. “Ryder took 28 seconds out of Rodriguez in the first 10k,” says Peiper. That left him only three more needed to win, and while Rodriguez fought hard, Hesjedal did enough to win the Giro by 16 seconds.